A residential design with extensive deck, pool, productive space and native planting. The project included the initial concept design, followed by the Preliminary and Tender Documents. The deck is to be constructed using beautiful spotted gum timber in a ‘wharf’ deck profile. We have complimented this with the use of permeable paving and large rectangular bluestone pavers. The garden will also have a greywater diverter system for irrigation of parts of the garden. This kindergarten is located on a busy street and is very exposed in Summer. The area consists of two distinct playspaces – one for the younger kids and one for the older kids. There is a gate between the two areas which can be opened or closed depending on the centres requirements. We utilised the natural grade of the site to create level changes. There is a variety of surface materials and textures to add to small scale interest. 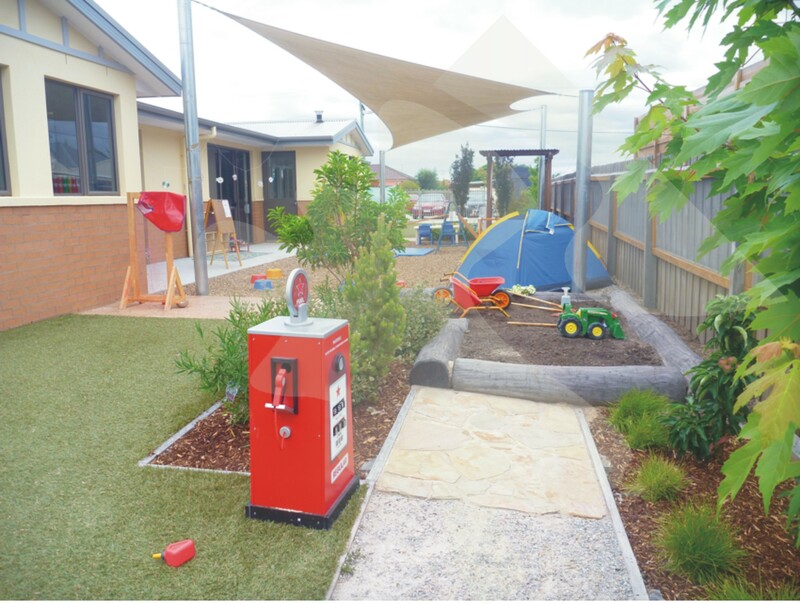 This centre has recently changed ownership and the existing playspaces was considered unsuitable – a more ‘natural’ garden like playspace was required. The existing trees have been retained and used in the new design. An area which was hard to supervise has been used for a productive garden which is fenced from the rest of the playspace area. Each room has an associated covered deck area which are utilised for a variety of activities. One of these deck areas also doubles as a stage area. This project involved the schematic design of a playspace, then the concept design followed by installation of a playspace in Parkville. Construction was completed mid-2011. 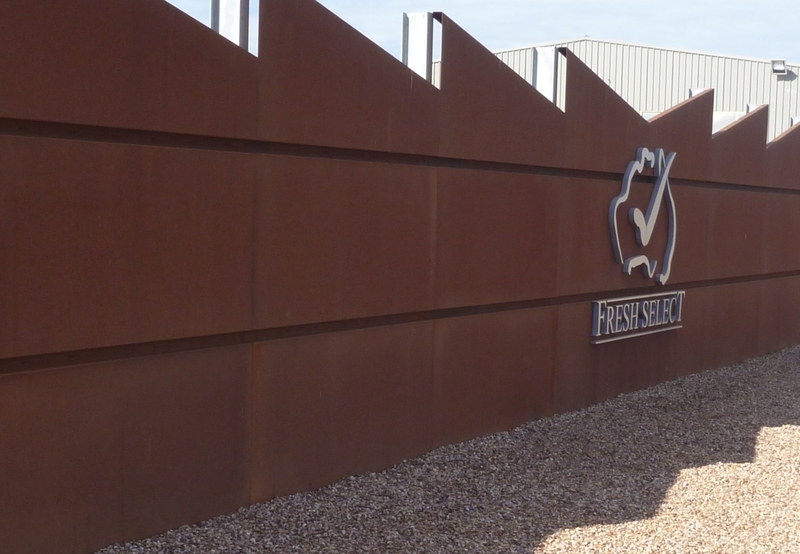 This project involves the design of landscape features for a large distribution centre. It included the development of an image and uniform material and colour palete as well as a circulation network for pedestrians and vehicles. This site was divided into four distinct areas and included a synthetic turf mound, sandpits, a digging patch, loose bark softfall areas and a productive space. Construction was completed in early 2011. The back garden was redesigned to include a deck and entertainment area, pebble feature and pond using water from a diverted downpipe, retaining walls, permeable paving, and native plants. The project was completed in 2010, and received a highly commended in the National AILDM Awards 2011. 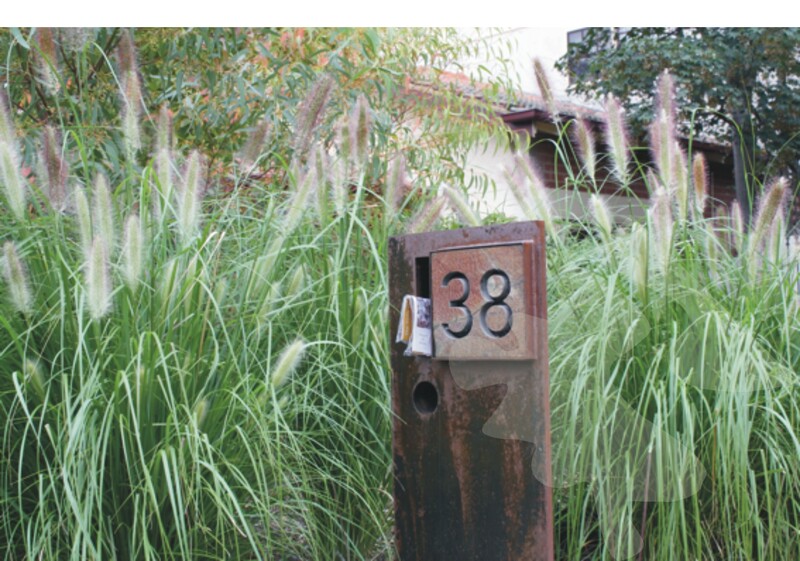 The front garden was redesigned to include a water feature, custom made letter box, native plants, new cross over, drive and paths. The project was completed in 2010. The segment featured the construction of 2 Raingardens. Botanical Traditions Designed the the raingardens and handled some of the practical issues and installation. One raingarden was an above ground Raingarden in a blue corrigated iron planting box and the other was an in ground system. The segment was broadcaste in early 2010. To see a clip of the Show here. Further information on some of our Raingardens - as well as other Raingarden designs Click here. Like many Primary Schools this one had an underutilized area full of potential. The design included the grading of the area to make it more user friendly, the installation of rock and concrete block retaining walls, a path, the addition of informal seating, a digging patch and deck lookout area, fruit trees, native plants and the formation of spaces for use as outdoor class rooms. Stage 1 was completed with a big planting day which involved the entire school in early 2010 during education week. The design aspect of the competition called onlandscape architects and architects to design green roofs for one or more of three short listed buildings. Botanical Traditions won 3rd place. Located in Central Victoria between Ballarat and Bendigo is the town of Maryborough with a historic railway station. The new Community Park and Playsapce will be located in this space. The design includes an amphitheatre, fenced Playspace, shady gathering areas, a path network and an extensive planting plan featuring indigenous, native and hardy exotic plants. The use of hardy exotics helps to compliment the style of the historic railway station and other buildings while the use of natives compliments and surrounding landscape and rural location of the Park. Although drought tolerant plants have been chosen a limited amount of drip irrigation supplied with rainwater will be installed to assist with the establishment of plants. Construction started in early 2010 and is expected to be completed in early 2011. The client wanted to develop a unique identity for the town. A number of concepts were developed. These concepts will be discussed within the council and then the chosen one will be developed further. This project involved the schematic design of a playspace, then the concept design followed by installation of a playspace at one of Monash Claytons Kindergarten. Construction was completed in mid 2010. This project was a Finalist in the 2010 Annual AILDM Awards. 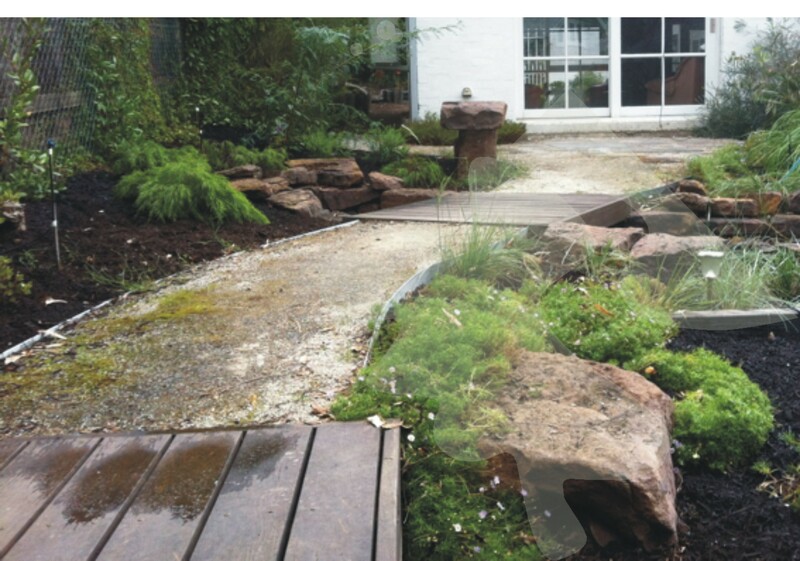 We have undertaken a number of Raingarden projects for Melbourne water. These include the raingardens at Armadale Primary School, Clifton Hill Primary School, St Johns Primary School, Debney Park Secondary School, and St Bedes Primary School. In a raingarden, rainwater is taken from hard surfaces and diverted through a Raingarden. Every student at these school planted at least one indigenous plant on the planting day. In this project we were engaged as the Melbourne based Horticultural Consultants to carry out over 100 Garden Sustainability Surveys. This project involved the design and construction of a large deck surrounded by a contemporary garden. The clients wanted an extensive outdoor entertainment area with a interesting, but low maintenance planting scheme and an irrigation system that utilised rainwater. This project included the drawing of plans for council. An unique deck located in a garden planted with natives in a near coastal suburb of Melbourne. Working with Brook Dobbie Landscape Architects we further refined the existing plan and commenced with the project. A green manure crop was planted to help add organic matter to the soil. This project involves the design of landscape features for the Solar Systems Solar Power Test Facility located in Bridgewater Victoria. These features include a direct seeded visual screen, extensive indigenous planting, design of a staff outdoor area, swale system, treated greywater system and rainwater harvesting system. This project was a finalist in the Greenplumbing Commercial Project of the Year 2008. This project received a highly commended in the National AILDM Awards 2009. This project involved the schematic design of a playspace, then the concept design followed by installation of a playspace at the Monash Caulfield Kindergarten. Stage 2 and the final stage of the project was completed in 2010. This project involves the concept design of a kindergarden play space. The play space is to include a deck area, more family spaces, vegetable growing areas and indigenous plants. The design must be suitable for situating in a natural like environment. Do you need help in preparing a permit application for a greywater treatment system? We can help. The client approach us to create a formal but unique garden. There will be an extensive rainwater harvesting system and greywater treatment system. The client had extensive City views but wanted some green areas to soften the balcony areas. A very unusual garden located on the south eastern outskirts of Melbourne. Bold planting boxes balance on each other, while stripes of massed planted groundcover, rocks and lawn disect the landscape. A woodland inspired design located in the eastern suburbs of Melbourne. It is still possible to create aspectacular display of plants even when the conditions are dry and shady. This design utilizes traditional english perennials, trees and bulbs to create a garden that changes with the seasons. A contemporary landscape design for a small inner city garden located in the eastern suburbs of Melbourne with a focus on colour, texture and Australian plants. This garden design makes use of bold and vibrant colours, a mix of native and exotic drought hardy plants, lighting and a water feature. A contemporary garden design for a courtyard garden located in the inner western suburbs of Melbourne. When you are in this contemporay courtyard garden you would never know that you were surrounded by warehouses and large sheds.